The heat is on for His Holiness with Cardinals in hot but by no means trivial pursuit. Step 1: Issue a press release that the Pope is really ill, dangerously so. Issue a call to prayer for the Pope. The Catholic world prays. Concern grows to a crescendo. Laity, priests, bishops, cardinals, The Tablet, the UN, the World Bank, Leonardo Di Caprio. Everybody's concerned! 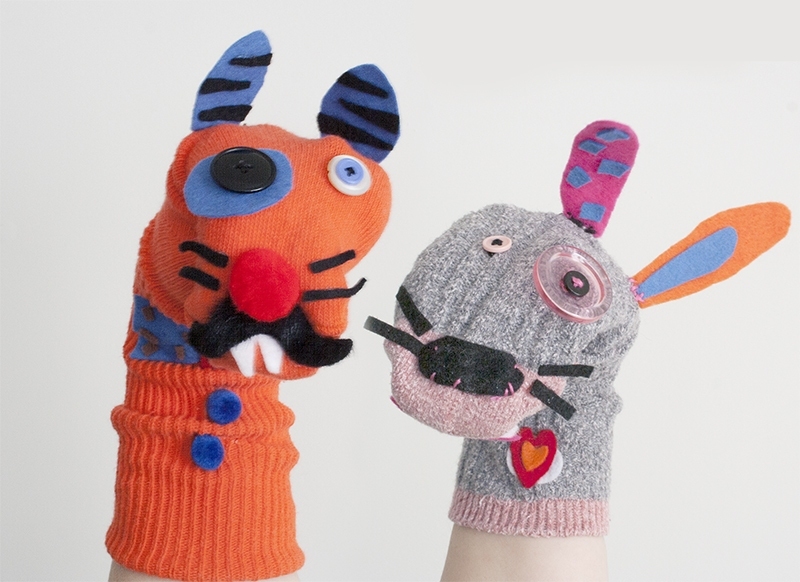 Spadaro's sock puppets. Now vacating their Twitter accounts. Step 3: 'Three days later', or alternatively at his 'funeral', Fr Spardaro or one of his less intelligent sock puppets goes back onto Twitter with a picture of the Pope having emerged from the jaws of death unscathed, having been 'pronounced' 'dead' only to be raised to life by God (for who else could have been responsible for this marvel), thus ending any 'doubts' that this man is truly the anointed one of the God of Surprises - and a Catholic Pope to boot - to bring the Church up to date with modern times and send Christ's teachings into the trash can. His Eminence did reply but his reply amounted to a rather deft deflection of the question. Questions nowadays are very threatening. 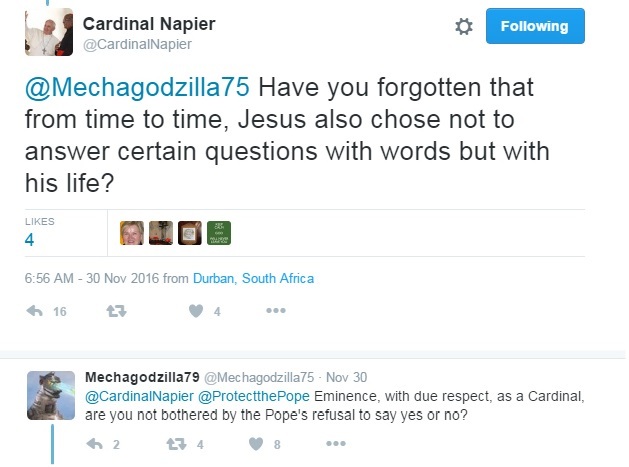 Popes have a phobia of them and this phobia of answering questions extends also to some Cardinals. If you can develop this theme that the Pope is 'just like Jesus Christ', I'm telling you this could work like a dream, or a dystopian nightmare, especially in this age of scruples-lite papal press spokespersons, sycophantic advisers and the internationally renowned and mysterious power of the Jesuits. Not all Jesuits are shady. But some are. 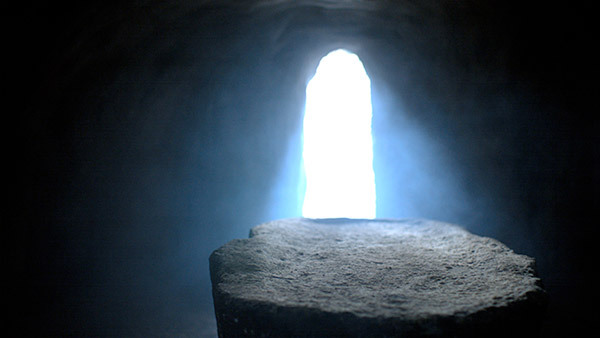 Who would dare challenge a man who has risen from the dead, his authority or legitimacy? Who would question him? The whole world would bow down before such a man - 'He's just like / better than / more wonderful than Jesus!' and even the faith of the elect of God would be put to the greatest of tests. Of course, His Holiness would never go along with such an audacious, ambitious, nay humble proposal, but in desperate times, some of his advisors could have been asked to come up with ideas that are 'outside the box' since just attacking the four Cardinals in public makes them look like a bunch of bullies with zero intelligible arguments. One jokes but clearly Austen Ivereigh is already comparing those who question the Pope to be like the Pharisees who questioned Jesus Christ our Lord with 'trick questions'. Are you happy now Cardinals! See you not what you have done??! What better way to counter the dubia and make everyone forget about those five doubts than to remove all doubt and replace that doubt with the certainty that Pope Francis is so much like Jesus Christ that God does 'miracles' for him to ensure the whole Church 'believes'. 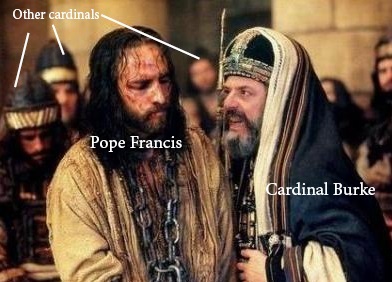 Yes, a Church that could say 'Pope is so much like Jesus he kind of is Jesus or even better' would make the post-dubia Church a whole new battleground with a whole new set of rules for the Church, for 'saving the planet', politics, economics and for those who would be deceived. I nicked this idea from a blogpost from a lady who is said to live in Ireland going by the first name of 'Maria', so its only right to H/T her. Only fair. Credit where it's due. I dunno. I always thought the antichrist would be better looking. I'm sure it couldn't happen just like that....really! A good father will patiently answer the questions from his child even if he is exasperated by them but he does so out of love. A good spiritual father would do the same. Our Lord did not answer Pilate because the one posing the question did not want the truth. 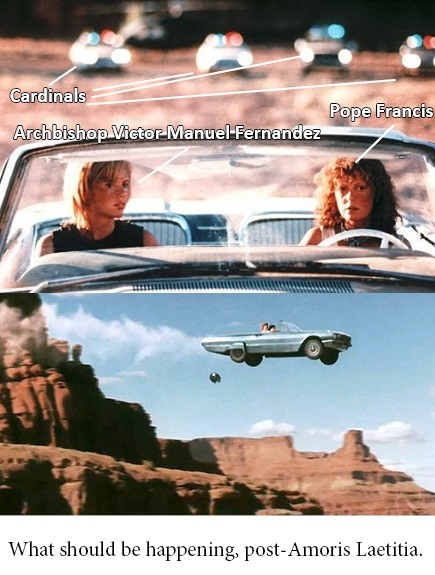 Jorge Bergoglio is not answering Cardinal Burke et al. precisely because they do.